Well not quite, but that's how it felt when the Hill Collection Etsy Shop received it's VERY first order earlier this week! To top it off, it's not even someone we know! Not saying we wouldn't love for family and friends to visit our little shop, love something, and order it. But, it feels pretty incredible to know that some complete stranger (with pretty swell taste, I might add), having no ties to either husband nor I found our wood crafts and liked them so much they wanted it for themselves. I think you get what I'm saying. It's really neat and it makes us feel kind of official now. We're business owners after all and now it truly feels that way. So we're going to get working on handcrafting some candlesticks because someone's tabletop is calling. Honestly, I think I'm most excited to finally use our packaging (presentation is everything)! Ahhh, sometimes life is about being short, sweet, and simple. This is one of those things! Yay for firsts! 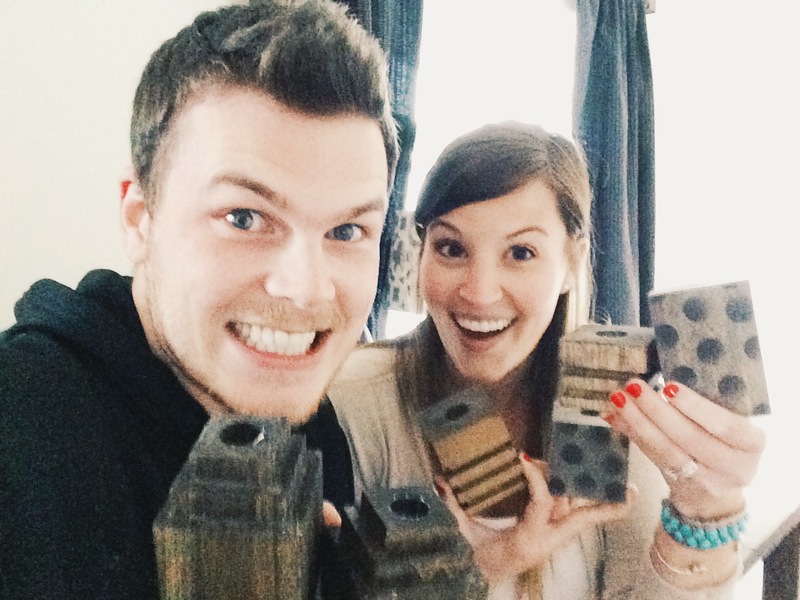 These are our excited faces in case you were wondering, and also our candlestick holders. If you haven't taken a peek around our shop, feel free to click on the "SHOP" tab above or just click here.